After hitting our first profit target this morning, USD/CHF found support and rallied back up to our entry level where we adjusted our stop. So, we closed out the second half of our position at breakeven. So we took something out of this trade. Not a bad start to the week! Just a quick update on our short USD/CHF position. Our short entry was triggered during the morning European trading session at 1.2050. We just saw strong move to the downside in the pair triggering our first profit target at 1.2020. Half of your position should be close and the stop on the remain position should be adjusted to breakeven. It’s a new week, so let’s get crack-a-lackin! 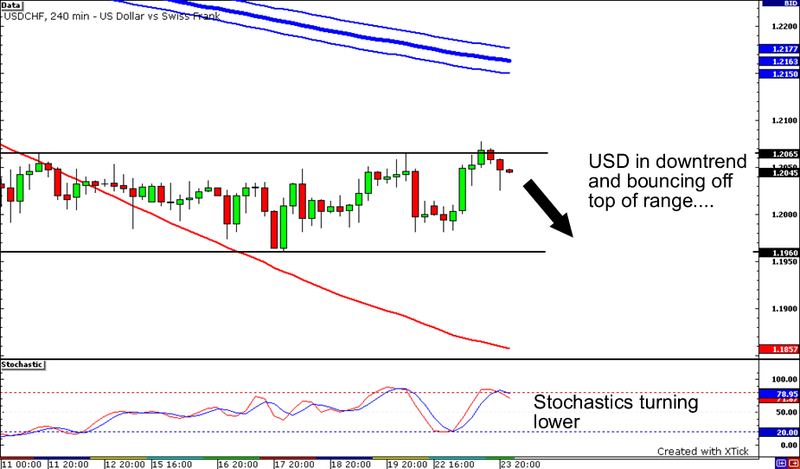 Today, we will be checking out USD/CHF, and with the lack of major news tomorrow we will go for a technical play and general market sentiment. Right now, USD is getting up beaten up left and right by most currencies, but not so bad by the Swissy. The pair has maintained a range around 1.1950 to 1.2050. It is currently coming off recent highs with stochastics beginning to turn lower. We will look to short to jump in the general USD bearish sentiment and target the bottom of the range we see on the chart. Please remember to never risk more than 1% of your account on any single trade. Adjust position sizes accordingly. Stay tuned because if the pair breaks above the range, then we will look for a long entry and ride this bad boy back up to the 240 WMA’s…..Good luck and good trading!